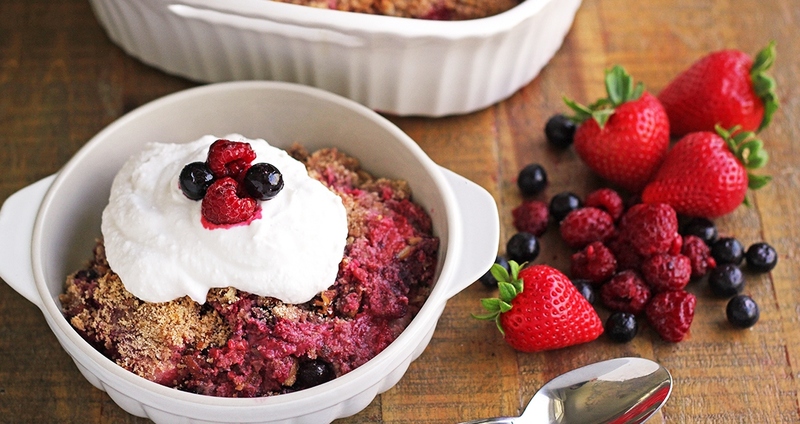 This Easy Berry Crisp is a delicious and healthy way to satisfy a sweet tooth! It’s dairy-free, gluten-free, grain-free, and free of refined sugars. It’s wonderful on its own, or topped with coconut whipped cream (recipe below). In a medium bowl, toss the berries with about 2 tablespoons of maple syrup. Add the berry mixture to an 8" x 8" baking dish. In the mixing bowl, add the almond flour, coconut flour, chopped pecans, cinnamon, ginger, nutmeg and sea salt. Mix well, then add the remaining maple syrup and coconut oil and mix until combined. Spread the topping over the berries. Bake for 30–40 minutes, until berries are bubbling and topping is golden. While crisp is baking, add coconut milk and 2 tablespoons of maple syrup to a large bowl. Whisk by hand or use an electric mixer for 2 minutes, or until fluffy. Serve warm, topped with the coconut whipped cream.